E-waste - "Waste materials generated from using or discarding electronic devices, such as computers, televisions, and mobile phones. E-waste tends to be highly toxic to humans, plants, and animals, and has been known to contaminate water, air and dirt at http://www.sustainabilitydictionary.com/e/ewaste.php." 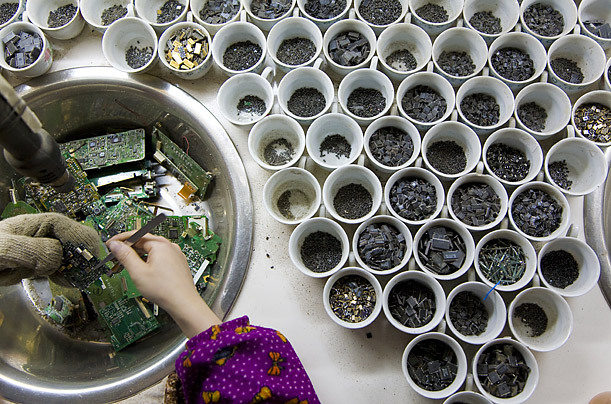 "Environmental groups claim that the informal processing of electronic waste in developing countries causes serious health and pollution problems at http://en.wikipedia.org/wiki/Electronic_waste." In some developing countries, it has been noted that the recycling or disposal of e-waste material can involved significant risk to communities and workers. 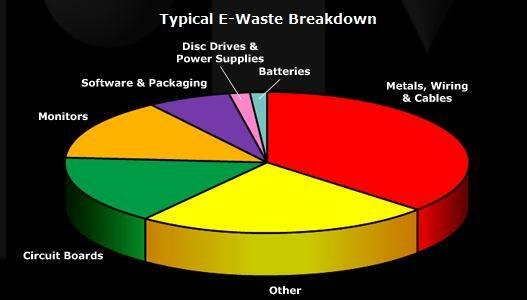 Much precaution is needed in the effective and efficient way of handling e-waste materials. "It has been estimated that 50 tonnes of e-waste is produced every year. the U.S. alone discards about 30 million of computers yearly, and Europe alone disposes about 100 million phones each year. In the United States, an estimated 70% of heavy metals in landfills comes from discarded electronics,while electronic waste represents only 2% of America's trash in landfills. The Environmental Protection Agency (EPA) states that unwanted electronics totaled 2 million tons in 2005, and 3 million tons in 2006. They also estimate that e-waste is growing at two to three times the rate of any other waste source. Discarded electronics represented 5 to 6 times as much weight as recycled electronics. The Consumer Electronics Association says that U.S. households spend an average of $1,400 annually on an average of 24 electronic items, leading to speculations of millions of tons of valuable metals sitting in desk drawers. The U.S. National Safety Council estimates that 75% of all personal computers ever sold are now gathering dust as surplus electronics.While some recycle, 7% of cellphone owners still throw away their old cellphones at http://en.wikipedia.org/wiki/Electronic_waste." "The Electronic waste recycling business is increasingly getting larger in areas of developed countries. Electronic waste processing systems have matured in recent years, following increased regulatory, public, and commercial scrutiny, and a commensurate increase in entrepreneurial interest. Part of this evolution has involved greater diversion of electronic waste from energy-intensive down cycling processes (e.g., conventional recycling), where equipment is reverted to a raw material form. This diversion is achieved through reuse and refurbishing. The environmental and social benefits of reuse include diminished demand for new products and virgin raw materials (with their own environmental issues); larger quantities of pure water and electricity for associated manufacturing; less packaging per unit; availability of technology to wider swaths of society due to greater affordability of products; and diminished use of landfills at http://en.wikipedia.org/wiki/Electronic_waste."